Sarah Epstein’s first manuscript was widely rejected, but she never gave up. 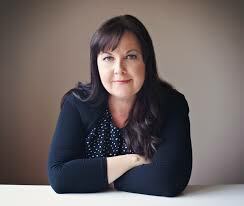 Here, she talks about her taste in dark thrillers, and how she finally came to be published. 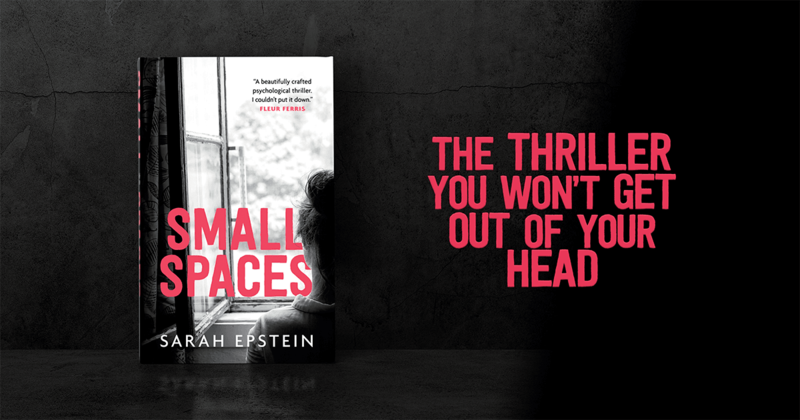 Small Spaces is a definite page-turner. What was your inspiration for the story? When I came up with the idea for Small Spaces, I was going through a very drawn-out submission process for my previous manuscript which was collecting a lot of “not high concept enough” type of rejections. It became clear that my new manuscript needed a strong hook to draw readers in, and I’d been thinking about the subject of imaginary friends for a long time. When my kids were little and attending playgroup and kindergarten, I’d hear stories from mothers about how they’d overheard their child’s one-sided conversations in the bath, or how their child’s invisible friend had to have a place set at the dinner table. I’d always think, where do these imaginary friends come from? Are they tied to emotional issues, loneliness or just boredom? Are they coping mechanisms, a cry for attention, or even, as some suggest, a spiritual presence that a child’s mind is open enough to see? This helped me craft the hook I hoped would intrigue readers: What happens if a creepy imaginary friend from childhood comes back? How did you come up with the character, Tash? I thought a lot about what the family dynamics might be like in a situation where a young child is visited by an imaginary friend, resulting in erratic and disturbing behaviour. Would the adults in her life intervene or just wait it out? And what would happen if the imaginary friend reappeared years later, throwing the now-teenager and her family into turmoil again? I realised at the core of such a story would be a character who is desperate to win the trust of others when she isn’t even sure she trusts herself. From this, Tash emerged and started telling me her story. As well as a riveting storyline, what do you think your readers will get out of what Tash is dealing with and her battles to question her sanity? There’s a well-known expression, “Everyone you meet is fighting a battle you know nothing about”, and that’s not only true for Tash and a number of other characters in this story, but for many readers as well. I think Tash’s self-belief issues are relatable, as are her fears and hopes about the future, and not fitting into ‘the norm’. To me, Tash embodies our basic desire to be heard and believed by those we trust most, as well as our sometimes fragile ability to believe in ourselves. You are passionate about the thriller genre. Why did you decide to write for the YA audience? Back in high school I wrote a creepy short story with a teenage protagonist, and my English teacher gave me full marks for it with a comment about wanting to read more because she was dying to know what happened next. The thrill of writing a dark page-turner stayed with me, and decades later when I wanted to try writing my first novel-length story, I used this as my starting point. I found my sixteen-year-old voice came through very naturally and I could easily tap into those same emotions, frustrations and challenges I felt as a teen. As I started reading YA more widely, I found the taut plots, character arcs and themes of self-discovery so appealing, and very suited to the types of stories I wanted to tell. As a graphic designer with your own business, can you discuss the influence your design experience had on your writing? I’ve always approached a manuscript the same way I approach a design job, with a client brief of sorts. I create a list of what I need the end result to achieve. Writing is similar to design work in that it’s a highly competitive field and your work needs to be attention grabbing enough to stand out in a sea of equally worthy creations. Working as a designer taught me to always meet deadlines and only submit my most polished work, as well as how to handle critique and maintain professionalism even when your work is getting torn to shreds. With design, it’s really obvious when something isn’t quite working – it takes a lot of tweaking to get things right, and this is the same method I apply to my writing. A trick I learned from a creative director early in my design career was to go away from something that’s not quite working and come back to it with fresh eyes. This is something I always apply to early drafts of my manuscripts – it makes it so much easier to identify the thing that needs fixing. What are your top five favourite reads of all time? I tend to have favourite authors rather than favourite books, so if I had to pick five that I wish I could rediscover all over again, I’d say Melina Marchetta, Patrick Ness, Liane Moriarty, Gillian Flynn and J.K. Rowling for the Harry Potter series (I’m yet to read her Robert Galbraith books, but I’m very interested). What book couldn’t you put down this year? The Ampersand Prize-winning YA novel In the Dark Spaces by Cally Black. I casually sat down to read a chapter or two and ended up devouring half the novel in one sitting, then finished it the following day. It’s a gripping read. Also Mark Brandi’s Wimmera was compelling and had me reading into the wee hours of the morning. Who has been your greatest influence as an author, and why? I have different influences depending on which genre I’m writing, so for Small Spaces my greatest influences were Rebecca James, Gillian Flynn and Liane Moriarty. I love all of Rebecca’s YA thrillers and when I read Sweet Damage and Beautiful Malice I was inspired to write something mysterious and suspenseful. I find the darkness of Gillian Flynn’s twisty plots and flawed characters mesmerising, and the nonlinear narrative of Dark Places encouraged me to look at an alternative storytelling structure for Small Spaces. And Liane Moriarty’s ability to craft compelling mysteries that hold readers’ interest and keep them guessing to the end is a skill I find endlessly inspiring. It took you five years of children’s naptimes to complete your very first manuscript. What advice would you give to other people juggling parenthood (and running a business), about writing a book? You need to allocate regular times to write and then protect this time fiercely. I started writing during my kids’ naptimes because I knew it was the only time in my day I wouldn’t be interrupted. I learned to make the most of small blocks of time because it’s all you get until they grow older. Once my kids started school, I could split my day into two work sessions – school hours for my design business, and after my kids’ bedtime for writing. Having a regular writing routine is the difference between ‘dabbling’ and actually getting a manuscript completed. And, of course, connecting with other writers on social media, especially those in a similar situation, is enormously helpful and inspiring. It helps to know you share the same aspirations (and sleep deprivation) with other writers. Now that you have your first publishing deal, what’s next? I’m currently working on two more standalone YA thrillers, and have plans to revise a contemporary YA manuscript I’ve already written. I’ve also started drafting some picture book manuscripts and an illustrated chapter book because I’m interested in merging my skills as a writer and illustrator. I find I’m never short of ideas, just the time to execute them.